I'm working with my Signals HW V1. I tried to use the Xbee modules to send the data of sensors but the modules of xbee are not working. I tried a basic exemple( light lamp of arduino ) to verify if they are ok or not but no result. The 2 modules could not send or receive data. When i used other Xbee modules they work fine. Does that mean my Xbee modules are defective ? Have you got any solutions to solve this problem ? 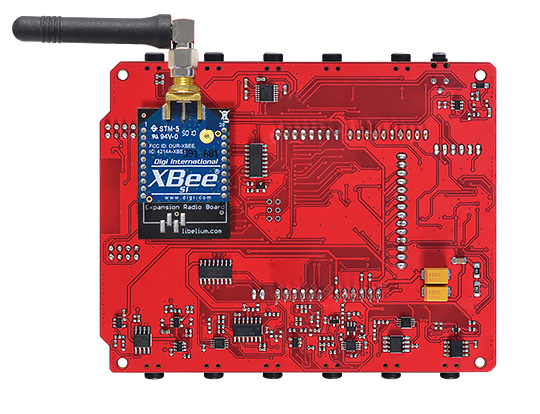 If you want to use the XBee modules, you need to use tge Libelium expansion board that allows your MySignals board to communicate wirelessly using Xbee. To verify if my Xbee modules work or not i used two arduino board without Mysignals shield (a transmitter and a receiver) but no result, no data transmitted. I changed the role of the 2 modules (the transmitter become the receiver and the receiver become the transmitter ) but no result also. Is the problem with the Xbee modules ? Are they defective ? It seems that you have got the modules with a wrong configuration. I tried to follow the tutorial to configure the XBees. I uploaded the Communication | Physical Pixel sketch to one of the boards. I have tested it by connecting to the board with the Arduino serial monitor typing an H, and pressing enter. The LED turn on, Sending an L the LED turn off. Now i Switch the jumpers to the XBee setting on the two boards. I connect both boards to the computer. But the LED on the first board doesn't turn on and off. Here is a picture of my two Arduino boards with XBee shields. Our Xbee tutorials are developed to use with the XBee shield, not with the Multiprotocol, you will need to modify the codes to work with them. Also, the Arduino M0 is quite different to the Arduino UNO, we have never tested it. You said If you want to use the XBee modules, you need to use tge Libelium expansion board that allows your MySignals board to communicate wirelessly using Xbee. What should i do to start the module? Should i work with MySignals.expanderState of The 3G (expansion board) ?? What is the code to use to send data from the Xbee in MySignals board to the other Xbee which will receive data? The receiver Xbee is connected to the arduino with a Xbee_adp ( not usb adapter so i can't do the configuration with XCTU) and i have not an ArduinoXBee shield. Correct, you need to use the same functions that allow the 3G/GPRS board to switch ON. Then you can send the command to the XBee module. You don't need a specific code. Once you have paired both XBee's all the data that you send to one XBee the other receive the same data. 1) In order send command from mySignals HW v1 to Xbee i used this code. But answer is always 0 and it's sending AT every 2 seconds. This module does not start. This is a screen shoot of the outout of this code. Have you got any idea about this problem? Address on the first Xbee and by defining The the same ID and CH parameter for both xbee? please try this code, if it doesn't work, change the baudrate to 115200.